Activated neutrophils play an important role in the pathogenesis of sepsis, glomerulonephritis, acute renal failure, and other inflammatory processes. The resolution of neutrophil-induced inflammation relies, in large part, on removal of apoptotic neutrophils. Neutrophils are constitutively committed to apoptosis, but inflammatory mediators, such as GM-CSF, slow neutrophil apoptosis by incompletely understood mechanisms. We addressed the hypothesis that GM-CSF delays neutrophil apoptosis by activation of extracellular signal-regulated kinase (ERK) and phosphoinositide 3-kinase (PI 3-kinase) pathways. GM-CSF (20 ng/ml) significantly inhibited neutrophil apoptosis (GM-CSF, 32 vs 65% of cells p < 0.0001). GM-CSF activated the PI 3-kinase/Akt pathway as determined by phosphorylation of Akt and BAD. GM-CSF-dependent Akt and BAD phosphorylation was blocked by the PI 3-kinase inhibitor LY294002. A role for the PI 3-kinase/Akt pathway in GM-CSF-stimulated delay of apoptosis was indicated by the ability of LY294002 to attenuate apoptosis delay. GM-CSF-dependent inhibition of apoptosis was significantly attenuated by PD98059, an ERK pathway inhibitor. 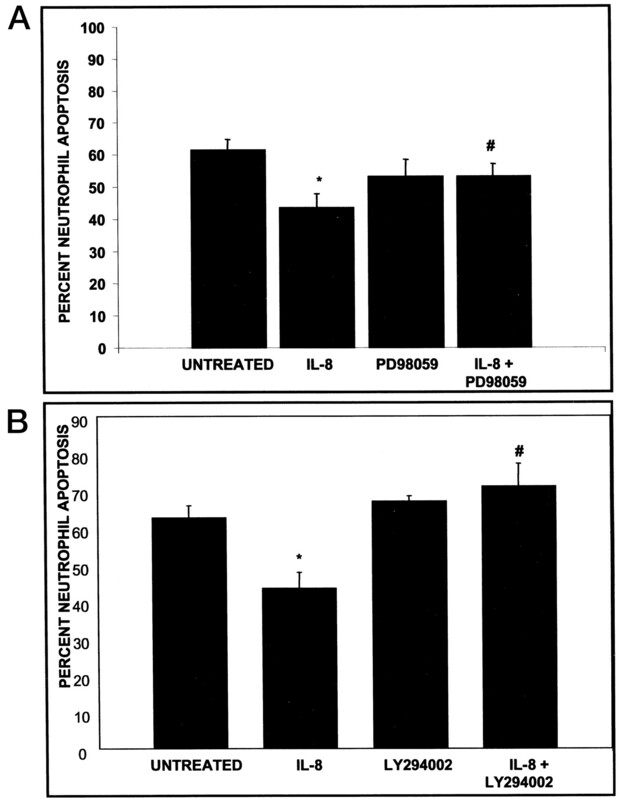 LY294002 and PD98059 did not produce additive inhibition of apoptosis delay. To determine whether PI 3-kinase and ERK are used by other ligands that delay neutrophil apoptosis, we examined the role of these pathways in IL-8-induced apoptosis delay. LY294002 blocked IL-8-dependent Akt phosphorylation. PD98059 and LY294002 significantly attenuated IL-8 delay of apoptosis. These results indicate IL-8 and GM-CSF act, in part, to delay neutrophil apoptosis by stimulating PI 3-kinase and ERK-dependent pathways. Neutrophil (polymorphonuclear neutrophils (PMNs))3 activation plays a significant role in the systemic inflammation of sepsis and ischemia-reperfusion injury. Apoptosis results in termination of PMN-dependent inflammatory damage by promoting the orderly death and removal of neutrophils without release of hazardous cell contents. Phagocytes engulf and remove apoptotic PMNs without rupture and spillage of their proteolytic granule contents, thus preventing damage to surrounding tissues (1, 2, 3, 4, 5). PMNs are constitutively committed to apoptosis, but their progression through the cell death program can be accelerated or delayed by cytokines and other inflammatory mediators. Exposure to TNF, IL-10, and phagocytosis accelerates apoptosis (6, 7). LPS, leukotriene B4, IL-8, and GM-CSF can inhibit or delay PMN apoptosis, although the mechanism of this effect is unclear (8, 9, 10, 11). Mitogen-activated protein kinases (MAPKs) play a significant role in controlling cell death machinery. In general, activation of p38 MAPK promotes cell death and extracellular signal-regulated kinase (ERK) activation inhibits apoptosis (12, 13, 14, 15, 16). Phosphoinositide 3-kinase (PI 3-kinase) is another kinase that can control cell death by phosphorylation of Akt that in turn can phosphorylate the BAD protein. GM-CSF has been shown to activate both the ERK and PI 3-kinase pathways in a number of cell types (17, 18). Therefore, we addressed the hypothesis that GM-CSF inhibits PMN apoptosis by activation of ERK and PI 3-kinase-dependent pathways. We studied the effect of GM-CSF on constitutive PMN apoptosis after in vitro culture in the presence of 10% FCS. We report that GM-CSF inhibits PMN spontaneous apoptosis by ∼65%. Pharmacologic inhibition of the ERK pathway and PI 3-kinase significantly attenuated GM-CSF-induced apoptosis delay. GM-CSF caused rapid phosphorylation of Akt and BAD proteins. To determine whether the PI 3-kinase and ERK pathways are used by other agonists, we examined their role in IL-8-dependent delay of constitutive PMN apoptosis. Pharmacologic inhibition of the ERK and PI 3-kinase pathways resulted in attenuation of IL-8-induced apoptosis delay. PI 3-kinase and ERK activation play a key role in the delay of PMN apoptosis by the inflammatory cytokines GM-CSF and IL-8. Endotoxin-free reagents and plastic disposables were used in all experiments. Recombinant human IL-8 and recombinant human GM-CSF were obtained from Genzyme (Cambridge, MA). The ERK inhibitor PD98059 was purchased from Biomol (Plymouth Meeting, PA) and the PI 3-kinase inhibitors wortmannin and LY294002 were obtained from Calbiochem (San Diego, CA). Anti-Akt and anti-phospho-Akt Abs were obtained from New England Biolabs (Beverly, MA). Anti-BAD and anti-phospho-BAD Abs were purchased from Upstate Biotechnology (Lake Placid, NY). PMN were isolated from venous blood obtained from healthy volunteers collected in ACD tubes. Cells were pelleted for 20 min at 175 × g and protein-rich plasma was aspirated. Protein-rich plasma was further centrifuged for 15 min at 1500 × g to produce protein-poor plasma (PPP). Erythrocytes were separated from the cell suspension by dextran sedimentation and the leukocyte-enriched fraction was centrifuged for 10 min at 175 × g. Pelleted cells were resuspended in 3 ml PPP and underlayered with 3 ml each of 42% Percoll in PPP and 50.5% Percoll in PPP. Following centrifugation for 10 min at 180 × g, PMNs were aspirated from the 42 to 51% interface and washed in PPP. Any remaining RBCs were removed by hypotonic lysis and PMNs were resuspended in cation-free Krebs-Ringer-phosphate solution. PMN preparations routinely contained >95% PMNs, as determined by morphology, and were >99% viable. Apoptosis was induced by extended culture in the presence of medium supplemented with FCS. Briefly, PMNs were cultured for ∼18 h in RPMI 1640 supplemented with 10% FCS, l-glutamine, penicillin, and streptomycin and placed in a 5% CO2/air incubator. GM-CSF (20 ng/ml) was added to PMN cultures as indicated. In experiments where kinase inhibitors were used, the inhibitors were added to PMNs for 60 min before the addition of GM-CSF. PD98059, wortmannin, and LY294002 had no effect on cell viability or the rate of constitutive apoptosis at the indicated concentrations. Flow cytometry was used to measure DNA content at the single-cell level using a modified method of Kettritz et al. (6). The method takes advantage of the fact that activated endonucleases generate low m.w. DNA fragments in apoptotic cells. After membrane permeabilization, these fragments leak out, resulting in decreased DNA content in apoptotic cells, whereas DNA content in nonapoptotic cells remains unchanged. In brief, isolated PMNs were pelleted and in PBS containing 0.5 mM EDTA. Chilled 95% ethanol was added to a final concentration of 70% to permeabilize the cells and the cell mixtures were stored at −20°C for 1–2 days. PMNs were resuspended in a PBS/EDTA/1% BSA solution. DNase-free RNase and propidium iodide were added. Cells were held for 15 min in the dark at room temperature, then incubated for 20 min at 30°C, and then stored at 4°C for 6–8 h in the staining mixture, allowing low molecular DNA fragments to leave permeabilized cells. PMN DNA content was analyzed using a Coulter Epics Profile II flow cytometer (Palo Alto, CA). Phosphorylated Akt was identified using a rabbit polyclonal Ab directed against phosphorylated Ser473 (New England Biolabs). Phosphorylated BAD Ab (anti-phospho-Ser136) was obtained from Upstate Biotechnology. Immunoblotting was performed using a method previously described, with modification (19). Briefly, PMNs (2 × 107 cells/ml) were incubated with GM-CSF (20 ng/ml) in the presence and absence of inhibitors for the described time periods. Cells were then pelleted and resuspended in a lysis buffer containing Tris-HCl, NaCl, Triton X-100, Nonidet P-40, EDTA, EGTA, Na2VO4, NaF, aprotinin, leupeptin, and PMSF. The cells were incubated on ice in lysis buffer for 5 min and repelleted, and the supernatants were denatured in Laemmli buffer. Protein samples were then resolved on a 15% SDS-acrylamide gel and transferred to nitrocellulose membranes and washed in a blocking solution containing 5% dried milk in PBS. The nitrocellulose membranes were then incubated overnight in HRP-conjugated primary Ab (anti-phospho-BAD, Ser136, 1:750 dilution, anti-phospho-Akt, 1:150 dilution) in 5% BSA/PBS. The nitrocellulose was then washed and incubated with HRP-conjugated goat anti-rabbit Ab (1:1000 dilution in 5% BSA in PBS). Bands were detected using an enhanced chemiluminescence technique and exposure to photographic film. Autoradiographs were then scanned using a personal densitometer (Molecular Dynamics, Sunnyvale, CA). Equal loading of protein in lanes was confirmed in all experiments by stripping and reprobing the blots for either total BAD or Akt. Statistical analysis was performed using GraphPad Instat software (GraphPad Software, San Diego, CA). ANOVA for repeated measures was performed to detect differences between multiple groups. Differences between groups were determined by use of a Tukey posttest. Data are presented as means ± SEM. Differences were considered to be significant when the p value was < 0.05. PI 3-kinase controls several survival pathways. Therefore, we examined the role of PI 3-kinase in delay of PMN apoptosis by GM-CSF. PMNs were pretreated with LY294002, a PI 3-kinase inhibitor, for 1 h before overnight incubation with 20 ng/ml GM-CSF. As shown in Fig. 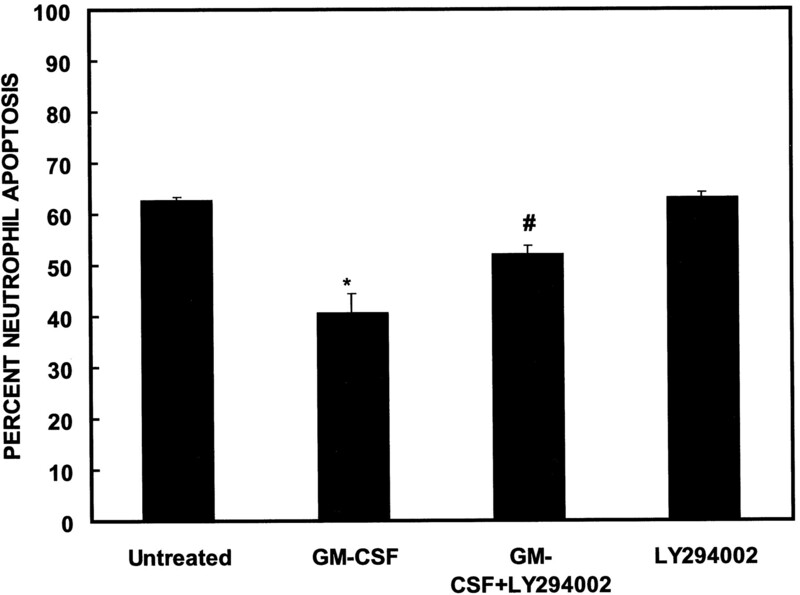 1⇓, 10 μM LY294002 partially reversed the protective effect of GM-CSF. PI 3-kinase inhibition attenuated GM-CSF-dependent apoptosis delay by ∼55% (percent PMN apoptosis: 63% untreated vs 41% GM-CSF treated vs 51% GM-CSF + LY294002 apoptosis). Similar inhibition of GM-CSF protection from apoptosis was observed with 50 μM wortmannin, an alternative inhibitor of PI 3-kinase (data not shown). These data indicate that delay of spontaneous apoptosis by GM-CSF depends in part on PI 3-kinase activation. Role of PI 3-kinase activation in GM-CSF delay of PMN apoptosis. PMNs were incubated in RPMI 1640 containing 10% FCS in the presence and absence of 20 ng/ml GM-CSF and with and without 10 μM LY294002 (an inhibitor of PI 3-kinase). PMN apoptosis was determined by flow cytometric analysis of DNA content. ∗, p < 0.05 when compared with untreated cells; #, p < 0.05 when compared with GM-CSF-treated cells (n = 7). One mechanism used by PI 3-kinase to prevent apoptosis is activation of the protein kinase B/Akt pathway (3, 20, 21). Fig. 2⇓ is a representative immunoblot (n = 6) of phosphorylated Akt in GM-CSF-stimulated PMNs. PMNs were incubated with 20 ng/ml GM-CSF for 1, 2, 4, and 5 min. Minimal phosphorylated Akt was seen at zero time, but significant Akt phosphorylation was observed after 1 min. PI 3-kinase or its products can phosphorylate Akt (22). To confirm that PI 3-kinase controls GM-CSF-dependent Akt phosphorylation in PMNs, we performed immunoblots of phospho-Akt in the presence of LY294002. As shown in Fig. 2⇓, PI 3-kinase inhibition by 10 μM LY294002 blocked GM-CSF-induced Akt phosphorylation. Similar results were obtained with 50 μM wortmannin (data not shown). Effect of GM-CSF on phosphorylation of Akt in PMNs. Shown is an experiment representative of six performed. PMNs were cultured with 20 ng/ml GM-CSF in the presence and absence of 10 μM LY294002, and cell aliquots were obtained after 0, 1, 2, 4, and 5 min. At each time point, phosphorylated Akt was determined by immunoblotting. Immunoblots of total Akt were performed to confirm equal protein loading. Phosphorylated Akt can exert an anti-apoptotic effect by, in turn, phosphorylating the protein BAD. In many cell types, BAD phosphorylation causes dissociation of BAD from anti-apoptotic proteins of the Bcl family, resulting in prolonged survival. We examined whether GM-CSF activation of Akt was associated with phosphorylation of BAD. Shown in Fig. 3⇓ is a representative immunoblot of phosphorylated BAD (n = 6). BAD can be phosphorylated at Ser112 and Ser136 (23, 24). Akt phosphorylates Ser136 and therefore we performed immunoblots using Abs against the relevant Ser136 phosphorylation site (23). Immunoblotting of PMNs exposed to 20 ng/ml GM-CSF for various times was performed. BAD phosphorylation can occur via PI 3-kinase-dependent and -independent pathways (24, 25). To determine whether PI 3-kinase activation is necessary for BAD phosphorylation, we examined the effect of LY294002 on GM-CSF-induced BAD phosphorylation. As shown in Fig. 3⇓A, 10 μM LY294002 significantly attenuated GM-CSF-dependent BAD. Fig. 3⇓B summarizes the pooled data from six separate experiments. Effect of GM-CSF on phosphorylation of BAD protein in PMNs. A, An experiment representative of six performed. PMNs were cultured with 20 ng/ml GM-CSF in the presence and absence of 10 μM LY294002 and cell aliquots were obtained after 0, 5, 10, 20, and 60 min. At each time point, phosphorylated BAD was determined by immunoblotting. B, The pooled data from experiments examining the effect of GM-CSF on BAD phosphorylation. BAD phosphorylation was quantified by densitometry of the autoradiograms. In B, the filled bars represent the fold increase in BAD phosphorylation after 5, 10, 20, and 60 min of incubation with GM-CSF when compared with the basal phosphorylation at time 0. 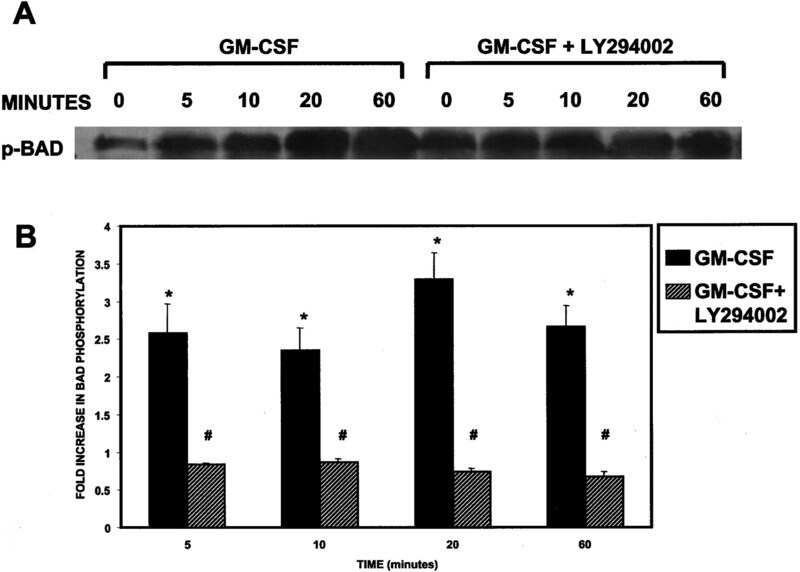 The hatched bars represent the fold increase in BAD phosphorylation at the same times of GM-CSF exposure when cells were pretreated with 10 μM LY294002. GM-CSF significantly stimulated increased BAD phosphorylation when compared with untreated cells (∗, p < 0.05). LY294002 (10 μM) blocked the GM-CSF effect as demonstrated by significantly less phosphorylation when compared with the GM-CSF stimulus alone (#, p < 0.005). Activation of the ERK pathway also exerts an anti-apoptotic effect in many cells. Therefore, we used the ERK pathway inhibitor PD 98059 to examine whether ERK played a role in GM-CSF-induced delay of PMN apoptosis. PMNs were pretreated for 1 h with 50 μM PD98059 and incubated for 18 h with 20 ng/ml GM-CSF. Fifty micromolar PD98059 alone had no significant effect on the rate of spontaneous apoptosis. As shown in Fig. 4⇓, 20 ng/ml GM-CSF decreased the percentage of apoptotic PMNs from 59 to 31%. 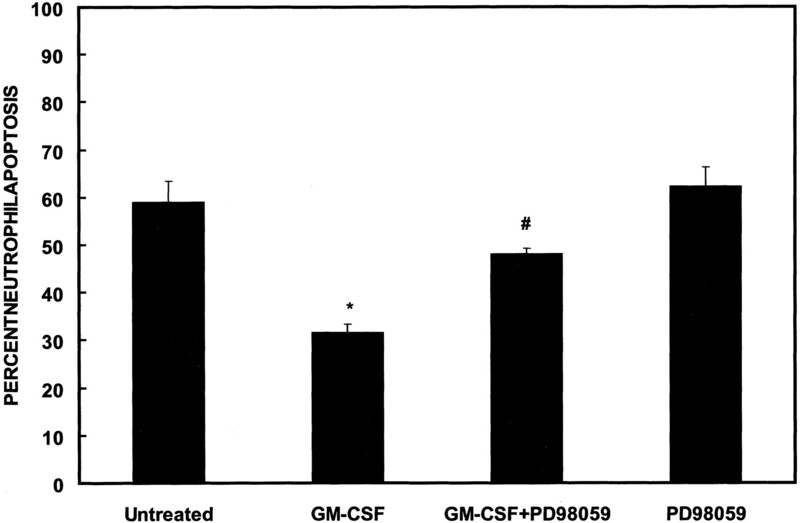 PD98059 attenuated the GM-CSF protective effect, resulting in apoptosis in 48.0 ± 1.2% of the cells, a 61% reversal of the GM-CSF effect. Role of ERK activation in GM-CSF delay of PMN apoptosis. PMNs were incubated in the presence and absence of 20 ng/ml GM-CSF and with and without the ERK inhibitor PD98059 (50 μM). PMN apoptosis was determined by flow cytometric analysis of DNA content. ∗, p < 0.05 when compared with untreated cells; #, p < 0.05 when compared with GM-CSF-treated cells (n = 6). To determine whether simultaneous inhibition of ERK and PI 3-kinase had an additive effect, we measured apoptosis in GM-CSF-treated PMNs that were pretreated with both PD98059 and LY294002. PMNs were incubated in the presence and absence of GM-CSF (20 ng/ml) with and without the ERK inhibitor PD98059 (50 μM), the PI 3-kinase inhibitor LY294002 (10 μM), or both inhibitors. PMN apoptosis was determined by flow cytometric analysis of DNA content. Combined treatment with PD98059 and LY294002 did not further inhibit GM-CSF apoptosis delay when compared with the effect of each agent (data not shown). To determine whether PI 3-kinase and ERK are used by other ligands that delay neutrophil apoptosis, we examined the role of these pathways in IL-8-induced apoptosis delay. IL-8 caused rapid phosphorylation of Akt as shown in Fig. 5⇓, and this was markedly attenuated by 10 μM LY294002. Effect of IL-8 on phosphorylation of Akt in PMNs. Shown is an experiment representative of six performed. PMNs were cultured with 100 nM IL-8 in the presence and absence of 10 μM LY294002, and cell aliquots were obtained after 0, 1, 2, 4, and 5 min. At each time point, phosphorylated Akt was determined by immunoblotting. Immunoblots of total Akt were performed to confirm equal protein loading. We examined whether IL-8 activation of Akt was associated with phosphorylation of BAD. Shown in Fig. 6⇓A is a representative immunoblot of phosphorylated BAD, and pooled data from six experiments are shown in B. PMNs were incubated with 100 nM IL-8 for the times indicated and immunoblots with ant-phospho-BAD Ab were performed. As shown in Fig. 6⇓, IL-8 rapidly stimulated BAD phosphorylation in PMNs, and this was markedly attenuated by LY294002. Effect of IL-8 on phosphorylation of BAD protein in PMNs. A, An experiment representative of six performed. PMNs were cultured with 100 nM IL-8 in the presence and absence of 10 μM LY294002, and cell aliquots were obtained after minutes. At each time point, phosphorylated BAD was determined by immunoblotting. B, The pooled data from experiments examining the effect of IL-8 on BAD phosphorylation in the presence and absence of LY294002. BAD phosphorylation was quantified by densitometry of the autoradiograms. In B, the filled bars represent the fold increase in BAD phosphorylation after 1, 2, 4, and 5 min of incubation with IL-8 when compared with the basal unstimulated phosphorylation at time 0. The hatched bars represent the fold increase in BAD phosphorylation at the same times of IL-8 exposure when cells were pretreated with 10 μM LY294002. IL-8 significantly stimulated increased BAD phosphorylation when compared with untreated cells (∗, p < 0.005) LY294002 (10 μM) blocked the IL-8 effect as demonstrated by the significantly decreased phosphorylation when compared with cells exposed to the IL-8 stimulus alone (#, p < 0.05). 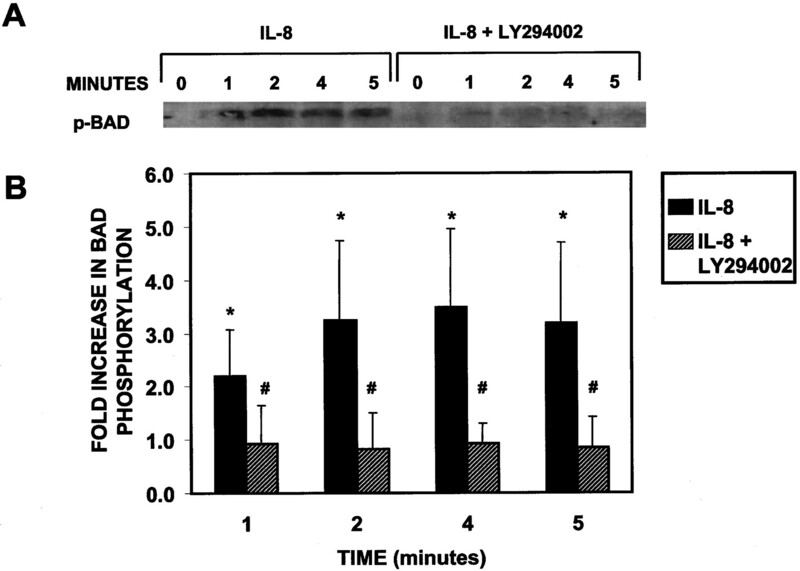 LY294002 also caused reversal of IL-8-dependent apoptosis delay as demonstrated in Fig. 7⇓A. Additionally, ERK pathway inhibition by 50 μM PD98059 significantly attenuated IL-8-induced delay of PMN apoptosis (Fig. 7⇓B). These data indicate that IL-8 and GM-CSF use similar signaling mechanisms to inhibit constitutive PMN apoptosis. Role of ERK and PI 3-kinase activation in IL-8-induced delay of PMN apoptosis. To determine the role of the ERK pathway in IL-8-induced apoptosis delay, PMNs were incubated with 100 nM IL-8 with and without the ERK pathway inhibitor PD98059 (50 μM, A). PMN apoptosis was determined by flow cytometric analysis of DNA content. ∗, p < 0.05 when compared with untreated cells; #, p < 0.05 when compared with IL-8-treated cells (n = 5). In separate experiments, PMNs were incubated in RPMI 1640 containing 10% FCS in the presence and absence of 100 nM IL-8 and with and without 10 μM LY294002, a PI 3-kinase inhibitor (B). PMN apoptosis was determined by flow cytometric analysis of DNA content. ∗, p < 0.05 when compared with untreated cells; #, p < 0.05 when compared with GM-CSF-treated cells (n = 7). PMNs are constitutively committed to apoptosis and do not undergo further differentiation or cellular division (4, 26). Bacterial products and cytokines released during sepsis can delay PMN apoptosis and delayed PMN apoptosis has been associated with severe clinical sepsis (27, 28, 29). GM-CSF, a cytokine released during septicemia, has been shown to delay or inhibit PMN apoptosis, but the mechanism by which this occurs is incompletely understood (30). We addressed the hypothesis that GM-CSF inhibits PMN apoptosis by activation of ERK and PI 3-kinase-dependent pathways. We used pharmacologic inhibitors of signal transduction to examine the mechanism used by GM-CSF to delay PMN apoptosis. Our data indicate that inhibitors of PI 3-kinase and the ERK pathway attenuate GM-CSF and IL-8 delay of PMN apoptosis. GM-CSF and IL-8 caused rapid phosphorylation of the protein Akt, a PI 3-kinase substrate, as determined by immunoblotting. Akt phosphorylation was associated with phosphorylation of BAD, a member of the Bcl-2 family. Reports in the literature indicate that two inhibitors of tyrosine kinases, herbimycin A and genistein, can attenuate the effect of GM-CSF on PMN apoptosis (22). An additional inhibitor of tyrosine phosphatase, phenylarsine oxide, promotes PMN survival (31). Wei et al. (8) used antisense oligonucleotides to deplete PMNs of specific tyrosine kinases associated with the GM-CSF receptor. Antisense depletion of Lyn kinase, but not Hck kinase, resulted in reversal of GM-CSF-induced apoptosis delay. Nonreceptor-associated tyrosine kinases such as Lyn activate a number of signal transduction pathways that can inhibit apoptosis. First, tyrosine kinase activation can lead to activation of ERK that in turn has been shown in many cells to exert an anti-apoptotic effect (32). Second, tyrosine kinases can activate PI 3-kinase that then can activate PKB/Akt, a potent anti-apoptotic signaling pathway. We observed that inhibition of PI 3-kinase partially reversed the GM-CSF-dependent delay of PMN apoptosis. GM-CSF also activated the PI 3-kinase target Akt that has been shown to inhibit apoptosis in a number of reports (25, 33), and GM-CSF-dependent Akt phosphorylation was blocked by the PI 3-kinase inhibitors LY294002 and wortmannin. Our data indicate that PI 3-kinase activation clearly results in phosphorylation of Akt and phosphorylated Akt may inhibit apoptosis by several actions. First, phosphorylated Akt functions as a serine-threonine kinase and can phosphorylate BAD, a member of the Bcl-2 family. BAD, when not phosphorylated, promotes apoptosis by forming an inhibiting heterodimer with anti-apoptotic members of the Bcl-2 family (34). Phosphorylated BAD dissociates from Bcl-2, thereby increasing the anti-apoptotic effects of the Bcl-2 family. Although the anti-apoptotic Bcl-2-like proteins in PMNs that form heterodimers with BAD are not clearly delineated, our data demonstrate that GM-CSF stimulates BAD phosphorylation. Akt can potentially inhibit apoptosis by two other mechanisms. Phosphorylated Akt causes activation of ERK and Akt has been shown to phosphorylate and inactivate an important member of the cell death pathway, procaspase 9 (35). Therefore, GM-CSF activation of Akt in PMNs could inhibit apoptosis by inactivating caspases, stimulating ERK activity, or disinhibiting anti-apoptotic proteins in the Bcl-2 family. The role of PI 3-kinase and ERK in IL-8-induced apoptosis delay was examined to determine whether the PI 3-kinase and ERK pathways are shared by other agonists that delay PMN apoptosis. The activation of these pathways plays a functional role in some effects of IL-8 on PMNs (38). As observed with GM-CSF, IL-8 stimulated Akt phosphorylation that was blocked by PI 3-kinase inhibitors. PI 3-kinase and ERK pathway inhibitors significantly attenuated IL-8-induced delay of PMN apoptosis. IL-8 also stimulated phosphorylation of BAD at the Ser136 site and this was inhibited by LY294002. Collectively, our data indicate that GM-CSF and IL-8 delay PMN apoptosis, in part, by activating ERK and PI 3-kinase. GM-CSF and IL-8 activation of PMN are associated with stimulation of the PI 3-kinase/Akt/BAD anti-apoptotic pathway. Pharmacologic blockade of the ERK and PI 3-kinase/Akt pathway may potentially exert an anti-inflammatory effect by promoting PMN apoptosis. ↵1 This work was supported by Merit Review grants from the Department of Veterans Affairs, the American Heart Association, and the Jewish Hospital Foundation of Louisville (to J.B.K. and K.R.M.). ↵3 Abbreviations used in this paper: PMN, polymorphonuclear neutrophil; MAPK, mitogen-activated protein kinase; ERK, extracellular signal-regulated kinase; PI 3-kinase, phosphoinositide 3-kinase; PPP, protein-poor plasma. Klein, J. B., J. A. Scherzer, G. Harding, A. A. Jacobs, and K. R. McLeish. 1995. TNF-α stimulates increased plasma membrane guanine nucleotide binding protein activity in polymorphonuclear leukocytes [published erratum appears in 1995 J. Leukocyte Biol. 57:803.]. J. Leukocyte Biol. 57:500. Berra, E., M. T. Diaz-Meco, and J. Moscat. 1998. The activation of p38 and apoptosis by the inhibition of Erk is antagonized by the phosphoinositide 3-kinase/Akt pathway [published erratum appears in 1998 J. Biol. Chem. 273:16630.]. J. Biol. Chem. 273:10792.